Simple ingredients create the best tasting frappés. 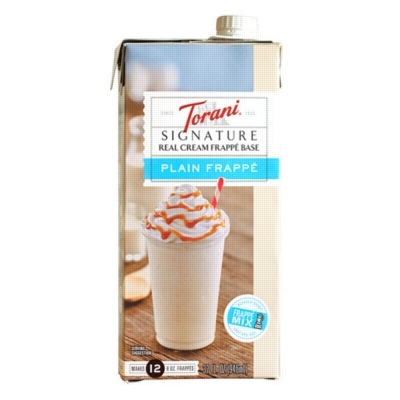 Crafted with real dairy cream, 100% Arabica coffee, pure cane sugar and whole milk, Torani Frappé Bases elevates your coffee and delivers extra creamy, velvety frappes every time. Simply pour over ice and blend for a delicious tasting frappe. For added delight, add a splash of Torani Syrups or Sauce. Simply a better way to frappe. Approximately 10 servings per carton. INGREDIENTS: Whole milk, water, sugar, heavy cream, non fat milk, natural flavor, sodium citrate, locust bean gum, xanthan gum, sea salt.